Tito's Back, but Can He Pull off an Unbeaten Season at Barcelona? Good news for Barcelona, and the football world at large was received when Tito Vilanova was successfully operated on to remove a tumor from his parotid gland in December. Just over a year earlier, he had undergone treatment at Barcelona's Vall d'Hebrón hospital for the same condition, but was back on the bench next to Pep Guardiola within a couple of weeks. Vilanova was absent during his side's comfortable King's Cup win over Cordoba on Thursday, with Jordi Roura stepping in to guide Barcelona to the quarterfinals with little fuss. Even Leo Messi had to watch from the bench as some of the fringe players got a chance; the Argentinean had not been in the dugout during a match for a year and a half. Those that were handed the task of seeing off Cordoba, a second division side that was bound to play as any other would at Camp Nou; valiantly, at least until the first goal was rattled in. Barcelona took its foot off the gas in the second half but still cruised to a 5-0 victory. Which brings up the question; can Vilanova guide the azulgrana to an unbeaten season? The likes of David Villa, Alexis Sanchez and Thiago, all goalscorers on Thursday, are not guaranteed a league start. Young players of the caliber of Sergi Roberto, Martin Montoya, Christian Tello and Marc Bartra were all involved against Cordoba. Even in the unlikely event of a raft of injuries, Vilanova has plenty in reserve. Enough to get past most top-flight teams in Spain anyway. Especially with Villa coming back into this sort of form. Barça's starting 11 is only matched by Real Madrid in La Liga. The only points Vilanova's side have dropped were in the first Clasico of the season. The unassuming Vilanova has already smashed the record for a best start to a campaign in La Liga, previously held by Real under Radomir Antic, which managed 12 wins and a tie. 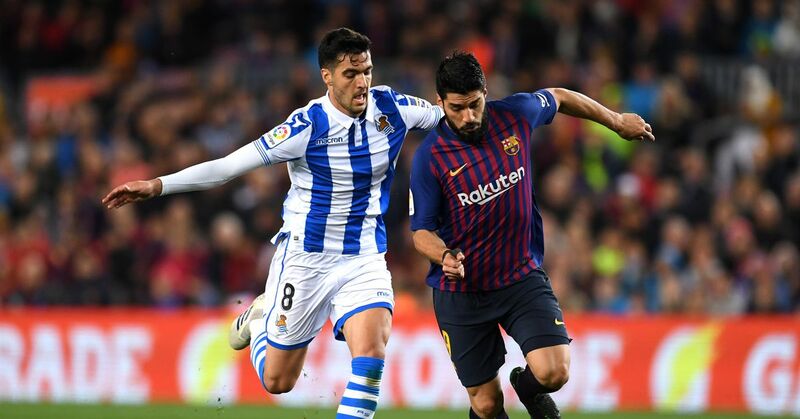 Barcelona travels to Malaga on Sunday in search of a 12th straight victory, four shy of the Liga record of 16 consecutive wins held by Guardiola's side in 2010-11. With 52 points from its opening 18 games and 61 goals scored, Real's records of 100 points and 121 goals in a season are far from secure. No team has ever gone the season unbeaten in Spain, although Guardiola's Barcelona came close in 2009-10, thwarted by a single goal in a 2-1 loss to Atletico. Vilanova returned to Spain on Saturday after traveling to New York to seek a second opinion about his state of health. It was reported that he expected to travel to the south coast with the squad on Sunday. He and Guardiola met for coffee, and what must have been a very pleasant chat. But the pupil has rapidly become the master. It will be fascinating to see what a Guardiola-led side might do against Vilanova's Barça next season. In the meantime, further greatness beckons for the fruit of La Masia's labor. With half the season played, Barcelona has essentially wrapped up the title. If no team manages to take three points off Vilanova's side in the remaining 18 games, will it be considered the best ever? Arguably, yes. Unbeaten seasons are not that uncommon. Juventus managed it just last year in Serie A. AC Milan did so in 1991-92. But being Calcio, Juventus chalked up 15 ties and Milan 12, the latter when Serie A contained 18 teams. So far only Real has managed to prevent a perfect run in the league. Second-placed Atletico was swatted aside at Camp Nou but enjoys a decent record against Barcelona in the capital. Malaga is one of few teams that can cause the league leader some problems. It remains to be see if that, or indeed anything, is enough to stop Vilanova's Barcelona joining the ranks of the invincibles.